Fashion bloggers, designers and brands are all flocking to Tumblr. Moves earlier this year by the micro-blogging site to showcase the affinity between the photo-rich site and the world of fashion seem to have paid off. After Tumblr brought 20 of its top bloggers to New York fashion week this season, the site has risen to popularity with high-profile fashionistas with Stefano Gabbana the latest designer to join. A couple of years ago I posted about how fashion was trending on Twitter. Two years later in continues to be the most popular post on this site. But by mid 2011it’s apparent that Tumblr is the new meeting-place for fashion and new media. Back in 2004 I joined Italian online fashion boutique, Yoox, as a press officer. In the mid noughties, reeling from the effects of the dot-com crash, not everyone got how new media could be used in the fashion industry. Now online fashion stores like Asos and Net-a-porter are trailblazers, Conde Nast’s Style.com is as influential, if not more so than iconic brands such as Vogue and bloggers are seated on the front-row of shows alongside fashion editors and movie stars. The official Tumblr of McQ, the contemporary line by Alexander McQueen offers insights and updates on the brand. Best of all it doesn’t just-regurgitate content. Earlier this year McQ’s spring/summer 2011 campaign was unveiled through a series of entries on the brand’s Tumblr site. Clever! This bearded photographer features stylish folks in their own clothes. It’s great antidote to the all the street-fashion sites that all seem so goddamn urban. Apparently the likes of GQ, Nylon, Vogue and Elle think so too. Not content with ruling Twitter the prettier half of D&G has turned to Tumblr and oh lordy what a treat his site provides. Showcasing a mixture of pictures, videos, tweets and audio tracks, Gabanna has entered into what Swipe magazine is calling “a new frontier: personalized chains of content distribution”. Dubbed “Facebook for the fashion set,” by the New York Times, Styled On is in its own words a platform of social discovery for style-minded individuals and brands alike. The Tumblr blog promotes and features magazine content while also acting as an online collage of fashion news and miscellanea. Gorgeous fashion editor and Lady GaGa stylist Formichetti shares photos of work and play from his travels around the globe plus snippets of inspiration. Street-chic, must-have items and the latest trends from the US edition of the magazine. 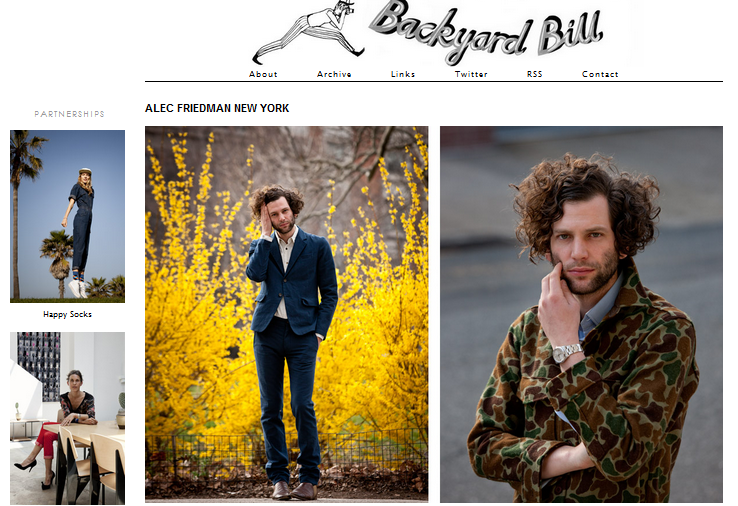 Undoubtedly one of the best fashion blogs that Tumblr has to offer. From inside the atelier to backstage at the show to sneak peeks at De La Renta’s book collection, the super stunning PR girl who writes this blog gives ODL obsessives everything they could ever want. Warning – this chick’s wardrobe will cause serious envy. Ty is the owner of downtown Chicago store Leaders 1534. Featuring streetwear, great shoes and cool video clips. I wish my boyfriend dressed like this! Fresh out of Brazil, Neonico is written by some of the most gorgeous bloggers ever. Obviously this isn’t a reason to follow this Tumblr blog, but it helps. Other reasons include delicious photos and well-sourced video clips. Fashion institution V magazine is an insane and unpredictable mix of people, places, and things that V celebrates in its pages. The beautifully designed blog promotes the magazine’s content. The daddy of Tumblr fashion blogs. This site gives you the inside scoop on the latest moves and trends within the industry. Imran Amed’s site features must-read interviews with industry insiders and is very strong on technology. Subscribe to its daily email newsletter. A perfect example of the web serving niche interests. The blog ID’s outfits worn by style icon in the making, Alexa Chung. On this super cool and always au courant site, Jillian Hobbs gathers the best of fashion, inspirations and beauty from around the web. As Tumblr makes it so easy to regurgitate content, many of the fashion sites can be very derivative. I’m not that there’s anything wrong with this per se but the end effect can often be samey sites that fail to bring anything new to the table. Not Another Fashion Book. Run by Antwain, a fashion student from Baltimore, the site features a mixture of fashion, celebrity and super-chic black folk. A veritable smorgasbord of stylish pictorial treats. Beautiful portraits. Perhaps more about women and less about fashion but definitely worth following. That the Council of Fashion Designers of America has chosen Tumblr for its blog perhaps epitomises the extent to which the micro-blogging platform has been embraced by fashionistas. Great for news, behind the scenes photos and video interviews. Milk, one of the world’s premiere photography studios, stands at the crossroads of fashion, photography, art and media. The Milk Made blog features written editorial and blog posts, exclusive photo commissions, cell phone content, and an interactive events calendar. One of Tumblr’s big boys. This much-visited site collates some of the hottest fashion photography from around the globe. Named one of the ‘Top 10 Most Innovative Companies in Fashion’ by Fast Company, Create the Groups’ blog isn’t strictly fashion. But given that the agency has its finger on the pulse of everything that matters it is definitely a site that matters. It’s no wonder these Christian Louboutin pumps are selling out so fast, who knew purple looked so good with red? It’s not a color combination I would have chosen, but it works. Really, any color looks good with red, as long as it’s the red from Louboutin’s signature sole. I’m just getting started with my Tumblr blog so this was a great help to get me started and who to follow in fashion! Thanks Sylvia, I hope you find it useful! Thank you for your compilation, some of these are now on my bookmarks, cheers from Spain! Hi! Thanks so much for featuring our Alexa Chung ID Tumblr 🙂 It’s really great to see it next to so many great blogs. Interesting now i have list of blogs i know i need to visit. atleast first 21st i know now. i am really happy to know there are so mnay blogs doing so well. thanx for the infoemation on 21 blogs. amazing style by Backyard Bill, alike it. . .
Woah, I had no idea that there were so many high end brands and quality fashion blogs on Tumblr. This is pretty surprising to me, considering I’ve always thought of Tumblr to be more of a sort of site for teenagers with angst (that being said, there are a lot of really good tumblrs that aren’t like that, but I think you know what I mean). Hi Yufi, yes its funny how random some of the blogs you see on Tumblr can be! But I think it does lend itself well to image-rich content. Thanks for commenting! monsmer.tumblr.com /// mine! follow me! NEW INDIE FASHION BLOG! lizashnyc.tumblr.com. We’re relatively new to the blogging world so thank you for this list. Really loving both WordPress and Tumblr. Thanks for these good tumblr pages! I hardly write responses, however I read a few of the responses here 21 top fashion bloggers and designers on Tumblr | The Hip + The Square. I actually do have some questions for you if it’s okay. Is it simply me or do a few of these comments look like they are written by brain dead individuals? 😛 And, if you are posting at other places, I’d like to keep up with you. This is the most ingenious piece of spam I have ever received. Compliments! Thank for the good pages ! TheDaysOfKate.Tumblr.com – Katie Krause’s tumblr. Well spotted – I like this too! This is exactly what i was looking for! Perfect blog post for beginner bloggers like myself.